If you’ve played any competitive online game for a decent length of time, you’ve probably come across the most persistent problem that plagues the genre: toxicity. Toxicity can take a number of forms, but the most common ones are flaming, feeding, and going AFK in the middle of a match. 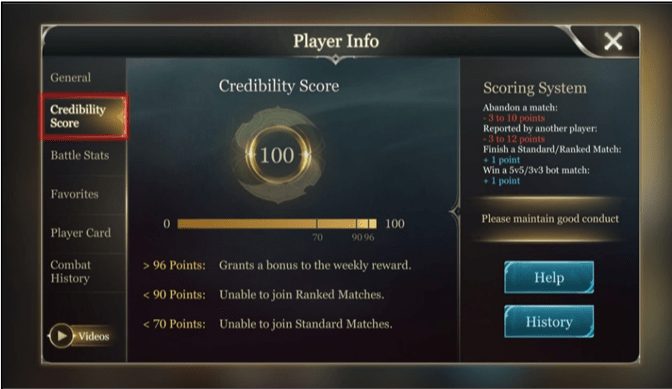 Arena of Valor’s credibility score system has proven to be incredibly effective at keeping this kind of behavior to a minimum. Every new account starts at the maximum possible score: 100. Then, you either lose or gain points depending on certain criteria. When you complete a match (whether it’s standard or ranked, and whether you win or lose), you gain a point. The same applies for bot matches (5v5 or 3v3). Losing points, however, is a bit harsher, which encourages players to moderate their behavior. Abandoning a match before it’s over means that you can lose anywhere between 3 and 10 points. If you’re reported by another player, you can lose anywhere between 3 and 12 points depending on the severity of your behavior. What Do You Need Points For? Here’s where the system really shines. If your credibility score is above 96, you’ll get a bonus to the weekly reward, which means that you’ll be able to purchase more heroes and Arcana, which will allow you to keep the game fresh and stay competitive regardless of the metagame trends. If you fall below this number, you won’t get the reward, and the consequences stop there… until you fall further. If your credibility score falls below 85 points, you are restricted from joining ranked matches till you get your score above this level by playing more games and keeping from abandoning, going AFK, and getting reported. If your score drops even further, below 60 points, you won’t be allowed to join standard matches either, which means that you’ll only be able to play with bots till you can fix your score. Because losing points is easier than gaining them, it’ll take you quite a bit longer to fix your score than it took for you to ruin it. This is very strong incentive to not fall below any of the above thresholds. If you think this is unfair or an overreaction, think of all the AoV games you’ve played where everyone was pleasant, or at least, where no one fed, went AFK, or abandoned the game. This credibility system keeps players accountable for their actions and ensures that, more often than not, everyone has a good game. If you do happen to drop below any of the credibility thresholds, it’s not impossible to climb your way up. It’ll just take a little time. Keep your chin up even when you’re losing. You don’t have to win a match to receive the +1 to your score. You only need to stick around till the end. Sticking around till the end of the match is only the first step. The next is to make sure that you don’t receive any more reports. You do this by not flaming your teammates, feeding the enemy team just because you’re frustrated, and by not going afk. This is really all you need to do, and your score will be up there, past 96 in no time.